146* "The Man with 10,000 Enemies"
and Mary Little (radio columnist). Clarence V.Mooney of Asbury Park, N.J.
151* "The Three Robbers" aka "The Three Dollar Robbery"
153* "The Train that Vanished"
155* "The Man who Played Dead"
causing all kinds of grief. Who's behind it? 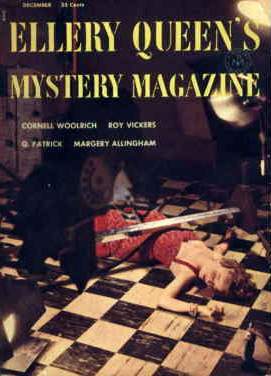 Above left: Pamphlet printed by Crippen & Landru as a tribute to Ellery Queen as Ghost of Honor at the 1998 Malice Domestic Mystery convention. Above right: Add for Radiola Release 128 an album in it's Crime Series. 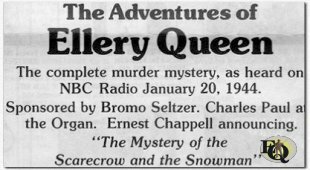 It has The New Adventures of Nero Wolfe starring Sidney Greenstreet "The Case of the Careless Cleaner" complete as broadcast on NBC radio November 17, 1950 and on the other side The Adventures of Ellery Queen. The complete murder mystery, as heard on NBC Radio January 20, 1944. Sponsored by Bromo Seltzer. Charles Paul at the Organ. Ernest Chappell announcing "The Mystery of the Scarecrow and the Snowman". 161* "The Scarecrow and the Snowman"
Foundation for Infantile Paralysis) and Gloria Swanson (actress). 163* "The Murder on the Air"
Audrey Christie (actress in The Voice of the Turtle Broadway play). NBC War Bond parade (02-05-44 at 12:00 pm) had Captain Glenn Miller; Band of the Army Air Force Training Command; Grantland Rice; cast of Adventures of Ellery Queen; Harry Hershfield on the show. 171* "The Case EQ couldn't Solve"
over 100 years ago. Has he come back for more? 174* "The Letters of Blood"
178* "The Bottle of Wine"
179* "The Great Chewing Gum Mystery"
the audience was used as a part of the show. 183* "The Corpse in Lower Five"
father set up a trap. Devils" at the end of last weeks episode. meet them one of the sprouts falls on his head. Fortunately Milo isn't dead. Nikki suspects David, Milo's brother and an artist who works on the top floor. It is unknown when this exactly happened, however Claudia appeared two times on the show (06-29-44 and 07-27-44). For the first show another (French) actress Annabella was announced in the newspapers. Also "Miss" Claudia Morgan was by then married to Ernest Chappell, the programs announcer, which could explain her readiness to fill in the gap. 189* "The Man without a Heart"
191* "The Man Who Wanted Cash"
Involves a king who sells out and for a million dollars in cash. August 18, 1944 Sydney Smith appeared as "Ellery Queen" on Bill Stern's Sports Newsreel. In these 15 minutes shows sports reporter Bill Stern tells many stories of and about sports and sports figures -- many are rumors, or even gossip. Each week he had a different guest who told a story themselves. 192* "The Mayor and the Corpse"
193* "The Dead Man's Bones"
196* "The Robber of Fallboro"
Source for "The Accused "in EQMM, 12/54 and "The Robber of Wrightsville"
East: Victor E. Chenea (vice-president of Pan American World airways). on circumstantial evidence, the boy's mother calls in Ellery Queen. clock that is heard ticking where no clock exists. Copyright © MCMXCIX-MMXI Ellery Queen, a website on deduction. All rights reserved.